I also specialize in new construction & land development. Serving but not limited to: Beacon, Fishkill, Dover, Dutchess,Hopewell Glen,Hyde Park, Putnam, Millbrook, Rhinebeck,Poughkeepsie,La Grange, Washington, Westchester, Orange,Wappinger, Highland & more. I am so pleased that I can work to help people "get on with their lives". Whether it is to buy their first home, step up to a larger home with a growing family, step down after the grown children have left or step out to move in with family or assisted living. My job is to make the move as much a pleasure as possible, in a caring manner. I love my job. Giving back to the community is very important to me and always has been. I sponsor a blood drive twice a year (April and September) that occurs at our office. With the help of my associates, clients, friends and family we have helped thousands of lives. The American Red Cross has presented me with the Platinum Award. Will you donate during our next blood drive? 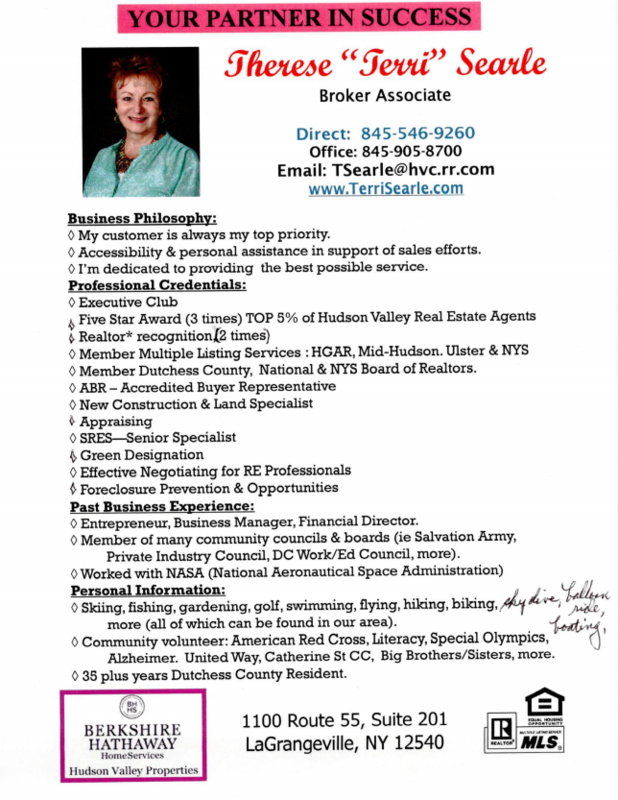 I have lived in the Mid-Hudson area for over 35 years, where I can ski, swim, fish, golf, garden, fly, hike, bike or sky dive. Join me in our Valley!